For press or business inquiries, please email our business address. We’ll make sure it gets to the right person! Well my friend, this is it. This is the day your mother was whispering about. 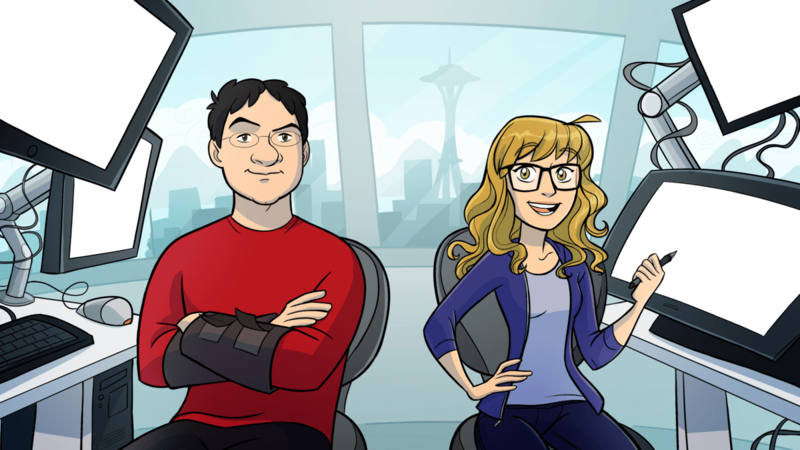 Together, we are Molly Rocket, a small but diligent video game research and development team located in Seattle, WA. Anna Rettberg is the one on the right. She draws the character art, provides extensive pop music condescension, and ensures that our office supply of Newman-O's is dispensed equitably and at a controlled rate. I’m Casey Muratori, the one on the left, and I do the programming. I am extraordinarily old and extremely grumpy, although scientists have yet to determine whether the two are correlated. I also host a live educational game programming series called Handmade Hero. Although we’re the only two full-timers, we also work with some awesome contractors. John Loren did the environment art for 1935, Randy O'Connor did 3D previz work, and Yangtian Li did the cutscene artwork for Handmade Hero. You can be yourself around us. We understand that meeting a new company can be difficult. But we’re different. To give just one simple example, suppose you were riding the bus and the lid on the water bottle in your backpack came open, spilling the water out, soaking not only your backpack but also the crotch of your pants. When you stand up, everyone is going to think you’re one of those drunk people on the bus who peed themselves, and nothing you can do will convince them otherwise. That feeling — the feeling that everyone on the bus thinks you peed yourself — is precisely how other companies make you feel when you visit their websites and play their games. We never make you feel like that at Molly Rocket. At Molly Rocket, we understand that it was water, not urine. When you awkwardly try to explain your soggy pants by showing us the water bottle’s faulty lid, we’re going to take the time to listen. That’s who we are as game developers, as people, and most importantly, as friends. And believe me, the first time you feel the feeling of knowing that we know how it feels to think that other people think that you peed yourself when you know you didn’t, you’re going to understand the Molly Rocket difference. Join our mailing list for news about our projects!